Seeing your progress throughout the month will help you isolate where you are going wrong. "This study showed that greater weight loss was associated with increased frequency of self-weighing, especially among those who self-weighed at least weekly." Lifting weights builds muscle mass and helps increase your BMR. A great workout to start building muscle is a circuit routine like this one. Doing cardio helps increase your V02 Max. It can also reduce body fat. Remember that the best way to reduce abdominal fat in the shortest amount of time is to do a interval training program like this one. Which is better? Eating 3 or 6 meals per day? We have broken this down for you. Please note that research varies on this. The most recent research suggests that it is most important to ingest 20-30 grams of protein 4 times per day to maintain muscle mass. You can use a tool like MyFitnessPal. Those that tracked their daily food records lost twice as much weight as those who did not (link). This is subjective to your own knowledge but if you're printing this out the odds are that you know weather or not you're eating right. Did you have any cheat meals today? 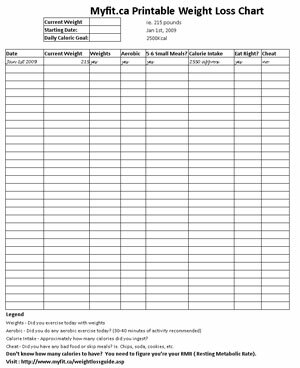 Logging these will help you visually see how much you do eat badly. The best way is to print this out and put it on your fridge. At the end of each day you can write down how you did. Just seeing what you did visually will help you find out where you are going wrong. Probably the best way to lose weight is to keep track of your progress through a weight lifting or training log book. Keeping a log of your progress has been shown to help adherance to any type of behaviour. This chart can be posted on ones fridge to help encourage a new lifestyle change.